The Genair® is an underdeck unit that utilizes a single PTO to combine power of a 125 to 185 cfm air compressor with the convenience of a patented, integral 7,200 to 11,600-watt AC generator. The Genair® system couples directly to the rear of the rotary screw air end. 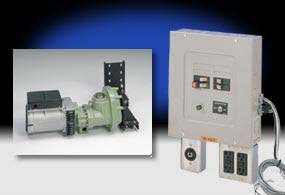 This provides constant power input without belts, pulleys, or tensioning devices.